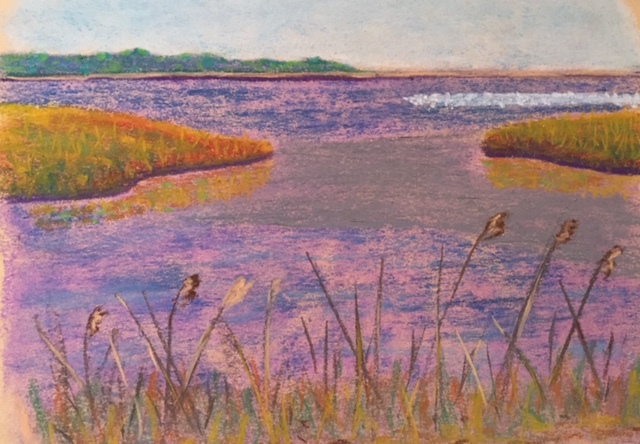 Posted on October 23, 2015, in Pastels, Plein Air and tagged Bombay Hook, Pastels, Plein Air. Bookmark the permalink. 2 Comments. Well to start – I just love this post. You inspire me as I read your words about the materials used and process of creating your plein air piece as well as your experience out there at the refuge several weeks ago. It is intreging to read the posts on the 30 Days To A Blog Challenge. Congrats on that. Your desire to constantly seek and learn is well inside you. Now through your posts I am honored to know another side of Kelly, my cousin. I am so glad we have a kinship whether we are related or not. Thanks so much for your kind words. Painting with PAPMA this year was such an enjoyable experience! Now, whenever I walk outside, I also am looking for something interesting to paint! Thanks again for reading.